Philly Beer Week, perhaps the grandest of all the beer weeks, starts May 31st, spans ten days and is host to over a thousand events. Launched in 2008, it is one of the largest, oldest and most respected beer celebrations of its kind. 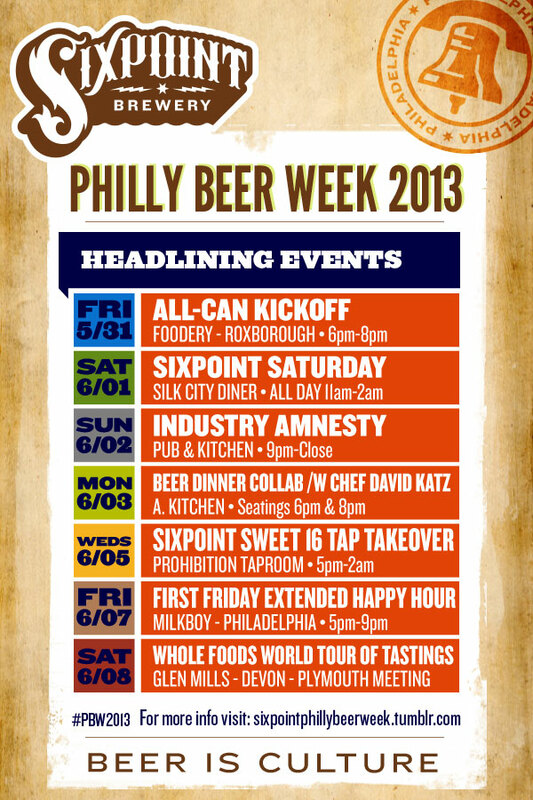 This year at Sixpoint we’re excited to be more involved than ever, with the honor of headlining seven events and attending several others, as part of a group of breweries. Sixpoint Rep ”Jersey” Dan Bisogno will be covering a number of events and updating his Sixpoint PBW tumblr. Check it for all our event info, tap-listings and liveblogging from various happenings. With events ranging from tap takeovers to brewer battles to hip-hoppy dance parties, Philly Beer Week is going to be a wild time. Follow Jersey Dan on the whole adventure here! And if you can make it, we hope you’ll meet us for a couple pints throughout this epic week. Remember to tweet your photos tagged with #SixpointPBW!